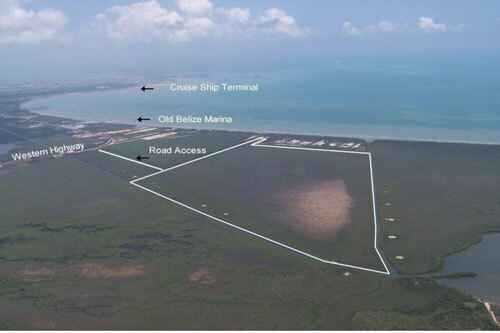 Beautiful and expansive canal front development equipped with all the best natural resources one needs to create a dream tourist entertainment park and cruise ship terminal in Belize. Ambergris Caye, Belize, June 15, 2017	(Newswire.com) - A great once in a lifetime opportunity open to all real estate investors is happening live in Belize this summer. Get down to Belize and grab a piece of the action with this 362-acre canal front development project up for sale by the renowned Coldwell Banker — Belize’s number one real estate development company. This is not an opportunity to be missed. The real estate industry in Belize is currently replete with attractive investment choices for foreign investors looking to purchase property in Belize, and with a wide range of breathtaking development possibilities. This particular canal front property is a goldmine waiting to be explored. It is located 4 miles from the Tourist Village Cruise terminal, one mile from the largest marina in Belize and ten miles away from the Belize International airport. It is approximately twenty minutes’ drive from the Belize international airport and features two miles of navigable canals leading to the Caribbean Sea. It is also located near the National Highway and all the utilities, and it is twenty minutes’ drive to three large hospitals, supermarkets, and all other amenities. Foreign investors who want to make the most of their investment in Belize are welcome to take advantage of this fantastic development property. Access to the property and a tour of its entire surroundings can be readily arranged for any interested persons at any time. Investors will be thoroughly oriented on the best use policies, necessary documentations, and the proper governmental permits needed to make the purchase a secured and highly beneficial one. Every information about the property is backed up by real facts; there is no denying its exceptional beauty and incredible potential. It is really a magnificent piece of land equipped with everything needed to turn it into a 21st-century tourist destination paradise. Investors can rest assured that they will be provided with the best possible service experience about the property and the development project from start to finish by Coldwell Banker. This is every investor’s dream property; one will be amazed at the many tourist entertainment park options available. There is a great opportunity for the land banking, residential development, and construction of the tourist entertainment park. The possibilities open to investors are endless — there is clearing for a cruise ship port and acres upon acres of land for constructing full-time residences and small business opportunities including stores, dining, tour shops, services, etc. There are also varieties of potential sporting and leisure activities all lined up for the benefit of both tourists and locals on this property. From snorkeling, scuba diving and fishing to pleasure spots featuring open bars for enjoying tropical drinks, sunset cocktails, and many more Belizean drinks. Discover that life here is very simple and relaxing, with locals that are very friendly and easy to get along with and be enlightened about the rich history this wonderful country has to offer. There are lots of interests that this development property will cater to and restaurants are also one of them. Belizeans love their local food and so do the tourists and full-time retirees too. In fact, the development will not be complete without a chain of restaurants strategically sited in the best locations on the property, all catering to the teeming visitors that would be thronging in and out of the tourist entertainment park daily. Restaurants are great for hosting family outings and this property offers the perfect seaside setting for sitting restaurants where visitors can enjoy lovely panoramic views of the ocean and the marina where the boats dock. Asides from the pleasant tropical atmosphere from the restaurants that this property promises to offer, the mouthwatering dishes and belly-full appetizers of the Belizean cuisine is another reason to keep the visitors coming back to Belize. There is also the opportunity for the construction of yet another cruise ship terminal. Within the next few years, the potential arrivals of tourists and retirees into Belize will be astronomical; especially those planning a vacation, couples looking to do their honeymoon or elderly people who want to retire here, and all other business that will bring people to Belize. The present cruise ship terminal will not be able to accommodate the impending influx, hence a new cruise ship terminal is critical. The good news is that there is enough space on the marina available to construct a state-of-the-art cruise ship terminal and it is very close to the port where passengers can disembark and head straight into the tourist entertainment park. The beautiful marina itself consists of crystal clear waters filled with teeming marine life and protected by the longest barrier reef in the western hemisphere. Visitors will have lots and lots of leisure, sporting and adventurous activities that will keep them happy and busy from dusk to dawn during their stay. This is one investment that is guaranteed to provide investors with a steady cash flow, multiple yields and a potential for explosive growth from the several tourist attractions that will be located on the property in just a few years. It also offers the opportunity to introduce a gated community, the first of its kind in Belize, which is another opportunity to enjoy brisk sales. It is a dream tourist holiday and retirement destination ready to be conceived, and it is only waiting for the right developer to take the responsibility. After the tourist entertainment park is completed, it would be the biggest and best of its kind in Belize — which offers another grand opportunity to be a part of Belize’s history. And the best part is, it is being given away at an unbelievably affordable price of $3,500,000. With an initial investment of just over $10,000,000 including outright land purchase, there is guaranteed to be an estimated $329,360,000 worth of potential net profit from this property. You can develop it in a project similar or even superior to Camana Bay and Old Belize. It is a really great buy and a true once in a lifetime opportunity!